Ecommerce has been a buzz since quite a few years now. It is an excellent avenue for selling products and services at competitive prices. Many businesses are now going online to take the advantage of the popularity of eCommerce among customers. However, setting up and managing an online store is a difficult task with a lot of things required right from maintaining inventory to managing shipping process. Magento is one such open source eCommerce platform, which was introduced to fulfill this requirement and streamline the entire eCommerce process. Magento is a very popular tool to build robust and powerful eCommerce stores of all sizes from single product to a million+ products web store. It comes with an array of features to give you complete control over your online store. Know more about why Magento is one of the best eCommerce solutions. The store owners generally prefer to add additional functionality or features apart from what standard Magento delivers, to customize their online stores as per their business requirements. 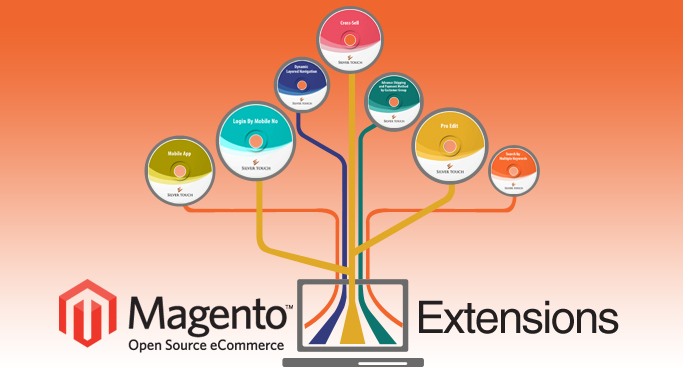 This is where the significance of Magento extensions comes into picture. Magento extensions are one kind of modules that can be integrated into your online store, for fully optimizing it and extending its functionality. Magento extensions thus offer customization, giving your store a personal and professional touch. They offer plethora of functionality to your eCommerce store, helping you better manage your web stores. You can either add pre-developed extensions available from third parties or can even get custom Magento extensions developed to fit the precise needs of your stores. There are thousands of Magento extensions available online and the number is increasing daily. This post is intended to highlight the top eight ways in which Magento extensions can transform your eCommerce store. Let’s take a look at them one by one. Magento Extensions not only scale your web store with additional features, but also ensure that whenever new upgrades are available on Magento-your development code does not need to change as the extension sits over the code Magento framework rather than be a core code change, thus giving you an advantage of using the extension with minor updates even when Magento version is upgraded. Magento extensions address the various functional requirements of your eCommerce store. They enhance the overall performance of your store and manage the operational workflow of your store efficiently. They add result oriented functionalities to your store, making it unique and feature-rich. They fasten the processing of the entire eCommerce transaction, making it effortless for users. Magento extensions make your online store user-friendly for your visitors. They make your eCommerce site easily navigable and understandable. They thus enhance user experience, giving your customers a pleasant shopping experience. They also enable your store to work seamlessly and efficiently, attracting new customers and retaining the existing ones. Magento extensions apart from meeting the precise needs of a business also bring innovation to their online store, helping them make it unique. With a diverse range of Magento extensions available, you will get more ideas to customize your stores. Magento extensions will help you to decide what other things can be added and creativity be brought to your store to enhance its capabilities and add value to customers. Magento extensions offer customers great flexibility to add product for future purchases and wish lists, notifies customers whenever the product is available, gives alerts to customers for arrival of new products and much more. Magento extensions can help you to get higher page ranks on various search engines. They can help you in increasing the visibility of your online stores by giving effective SEO results. Thus they can improve the performance of your stores, giving you a competitive advantage. By using Magento extensions, the requirement of designing and developing various functionalities for your stores is eliminated. You might find a large number of free extensions available to meet your requirements, helping you add rich features to your online stores. This also saves a lot of time by alleviating developers from building the add-on functionalities from the scratch. Magento extension approach to your development requirement for additional functionalities for your stores, cost less in the long run. Magento extensions can help you to go global through your eCommerce stores. They can handle multiple stores through a single admin control panel. Your clients can be automatically redirected to your e-store in the language of their residing country. The currency can be automatically set based on the specific country. This encourages hassle-free eCommerce transactions across the globe. Magento extensions will thus help you to run your store effectively with its user-friendly and robust functionalities. They can add great value to your eCommerce store, benefitting you as well as your users. They will provide an exquisite shopping experience to your customers by efficiently managing different eCommerce functions. They even have a large community of users, giving you technical assistance in installation as well as customization of the extensions along with providing resolution to your issues. Cross-Sell: This Extension provides an advanced way to manage Cross-sell products in Magento back end as well as display Cross-sell products on front end in a list or grid view. Mobile App: You can get this Native Mobile App for your Magento Store at ONE time cost only, helping you increase your sales by 500%. Login by Mobile : This extension allows users to login through their mobile numbers from frontend. Multi Admin with Category Management : This Multi Admin with Category Management extension helps to manage categories, CMS pages and Configuration section. Cart Popup :By using MyCart extension the user is presented with a designed and detailed pop up of the Cart. Scrolling Cart : This Cart stays visible when the user is scrolling to give easy access. Up Sell Products : This extension allows you to up-sell your products in the Magento Store to increase sales and revenues. Slot Booking : Users can book slots for shipping through this extension. Delete Order : Standard Magento doesn’t allow users to delete orders. Delete Orders extension makes this possible. Dynamic Layered Navigation : Dynamic Layered Navigation block stays on the users’ screen even when the user scrolls on the page. External Links : This extension helps to create a Menu link that points to an external URL or any CMS page in the same site. Order Comment : This Extension allows the users to add comments on Cart Page for specific product. Import Order : Users can import Order Data CSV to Magento using this extension. Prolog Logistic Integration : This extension will synchronize your inventory and order data with Prolog Logistic software. Mega Menu with Drop Down and Static Block : It allows you to manage site navigation structure by categories and sub categories / product. Easy Blocks : Create custom dynamic blocks for Bestseller, New, Most Reviewed, Recently Sold and Most Viewed products through Easy Blocks. AuthorizeCIM : Store customer information on Authorize.net Secure Servers using this extension. The method is PCI compliant. Discount & Special Offer : It lets businesses to give discounts using mixed selection of Products, Multi Buy Offers, and Half Price Offers. Stock Inventory Management : You can update Inventory / Stock by importing a .csv file through Stock Inventory Management extension. Visitor Tracking : This extension will fetch customer referrer information like Referrer Domain, Referrer URL, Landing Page, Server IP and Date. Display Product by Zip Code : It allows you to increase your sales by showing Products which are relevant to users’ location. Store Backup : You can take daily Backup of your Magento Source and Database using Store Backup extension. Search by Multiple Keywords : This Extension provides a new feature to search products by entering multiple keywords in search text-area. Responsive Banner Slider with Multiple Content : This extension provides functionality to upload / manage Images, Videos or YouTube Videos in Banner Slider. Pro Edit-Advance Content Manager : Pro Edit – Advance Content Manager provides facility to the store owner to update Categories, Sub-Categories, Products, CMS Pages and Static Blocks directly from the front-end. Deal Banner : This extension provides you with the ability to set your own Message at the top of your store for easily attracting customers towards a Deal or Product. Brand Shopping : You can create Brand as a category and let your users browse products by Brand through Brand Shopping extension. Shipping and Payment Method by Customer Group : It allows you to manage customer group wise shipping and payment methods. Pre Order for Up-Coming & Not In Stock Products : This extension helps users to buy /book products that are upcoming or not available. Admin can also analyze customers’ demands. Product Selling and Grossing Report : This extension allows you to view top selling and top grossing products. Users can also export this report to CSV / XML format and can track product sales by SKU Report Widget. Our proficient Magento developers hold rich experience in designing, developing and customizing Magento extensions as per your business requirements, helping you boost your online sales and improve your ROI!! Get in touch with us through magento@silvertouch.com for getting tailored Magento extensions! !